The reins on the freedom of speech for Vietnam's growing political blogosphere just got tighter. On Dec. 18, Hanoi passed a new law prohibiting bloggers from creating posts the government says incite violence or crime, undermine national security, include inaccurate information that could damage the reputation of individuals and organizations, or disclose state secrets. It also requires global internet companies with blogging platforms operating in Vietnam to report to the Vietnamese government every six months  and to provide information about individual bloggers if requested. In Vietnam, a country where the communist government has controlled the media since North and South Vietnam were reunified in 1975, blogging has become a growing  and risky  new forum for political dissidents to spread information about social abuses and government corruption. The new generation of blogs covers everything from criticizing top ranking officials for chartering planes to monitoring labor violations. Before this month, no formal blogging or Internet restrictions were in place, but several cyber dissidents  such as Huynh Nguyen Dao, Nguyen Bac Truyen and Le Nguyen Sang  have been arrested for posting anti-government propaganda online. The government regularly shuts down politically sensitive blogs, and to avoid arrest, some bloggers have taken to writing under pseudonyms. "They have to use their nickname, and different computers so they can post the article," says Nguyen Thanh Trang, president of the California-based Vietnam Human Rights Network. And even so, he adds, "They disappear." In December 2007 and January 2008, 56-year-old human rights activist Nguyen Hoaong Hai  who blogged under the pseudonym "Dieu Cay"  organized demonstrations in Ho Chi Minh City against the government's permission of the Olympic torch to pass through Vietnam. The demonstrations protested Chinese occupation of the Paracel Islands in the South China Sea  which Vietnam also claims. Within months, police arrested Nguyen on charges of tax evasion  a move widely seen as retaliation. "It's pretty clear that what he was really thrown in jail for was for criticizing China's claim over the Paracels," says Bob Dietz, Asia program coordinator at the New York-based Committee to Protect Journalists. In December, an appeals court upheld Nguyen's 30-month jail sentence. 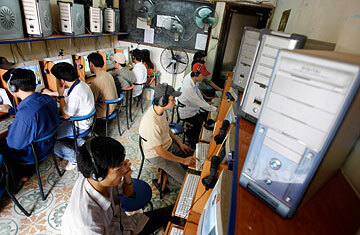 In October, Hanoi opened a new government arm called the Administration Agency for Radio, Television and Electronics Information, ostensibly to regulate Internet usage and monitor Vietnam's online users, which are predicted to increase from about 20 million today to 30 million by 2010. "Vietnam like China realizes the importance of the Internet if their economy is going to grow and they accept that the more people have broadband access, the better it is for the country," said Dietz. Although the new law prohibits bloggers from discussing politically sensitive subjects, it also states that the government officially encourages Internet use "in order to share and exchange information corresponding to Vietnamese habits, customs and laws, thus, enrich spiritual life and strengthen community cohesion." Luu Vu Hai, chief of the Administration Agency for Radio, Television and Electronics Information at the Ministry of Information and Communications defends the new regulations. "Every country has its own law and all activities must follow its laws in order to guarantee the social benefits," Luu says. It "does not mean to censor blogs, but to help and to educate the bloggers to maintain a healthy way of using Internet for their benefits." Whether the government will get the global companies working within its borders to help maintain that "healthy way" remains to be seen. Although the state-run newspaper Thanh Nien reported that Ministry of Information and Communication deputy minister Do Quy Doan will contact Google and Yahoo! about their cooperation, representatives from both companies have said they have yet to be contacted. Google, Microsoft, Skype and Yahoo have all been under fire recently for complying with the Chinese government to filter out content pertaining to controversial subjects in the country such as Falun Gong and Chinese occupation of Tibet. As for the writers, Le Phuong Thi, one of jailed blogger's Nguyen Hoaong Hai sources who fled to California in July after fearing for her own safety, believes they will carry on despite the new law. "It's an excellent tool to let the world know and spread the news of what's going on inside Vietnam because there are no independent newspapers or news organizations in Vietnam," she said. And while she can't return home and her former colleague remains in prison, stories of persecution like theirs stories are only fanning the flames of discontent  not stamping them out. "Right now the government is very afraid of the Internet," says Nguyen Thanh Trang. "The Internet is very powerful." Read "A Vietnam "War" in the Blogosphere"
Read "Top Vietnamese Journalists Arrested"